From charming villages to magnificent cities, British Columbia boasts numerous coastal towns for enjoying beautiful beaches, an abundance of wildlife and much more. 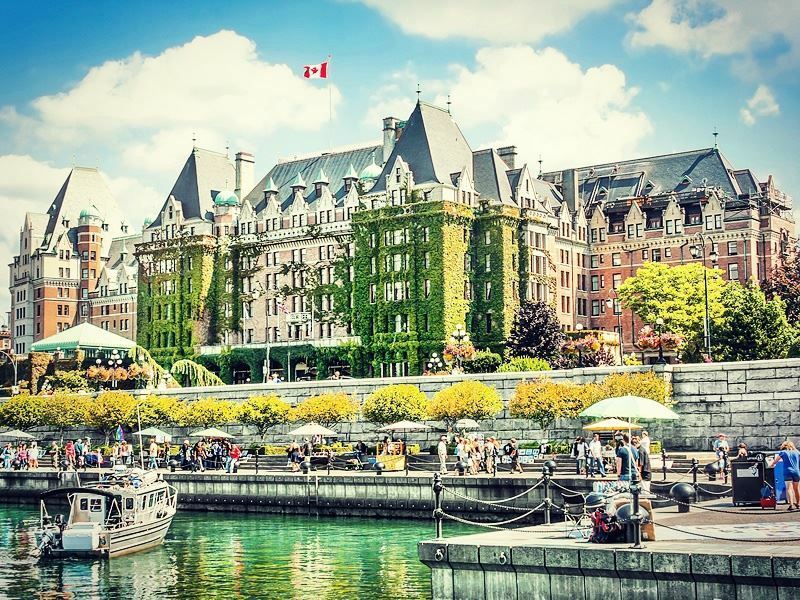 From the sprawling city of Vancouver and its quaint capital of Victoria to smaller gems like the Vancouver suburb of Surrey and the harbour town of Prince Rupert, you’ll be spoiled for choice in this province. 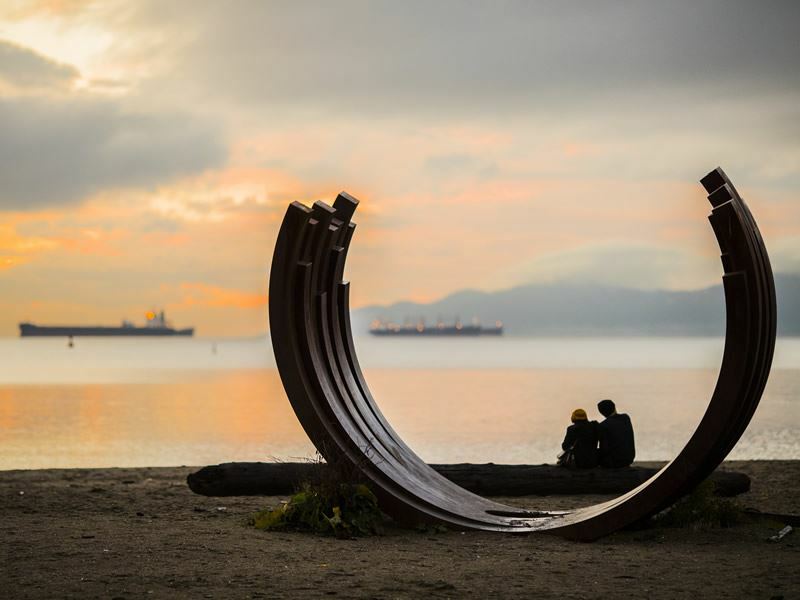 Set between the Coast Mountains and the Pacific Ocean, Vancouver is truly one of the world’s great coastal cities, a destination with a diverse landscape that provides a natural playground for outdoor lovers of all types. The beaches here boast soft sands, jaw-dropping mountain vistas, as well as providing an ideal setting for all sorts of activities on land and on the water, not to mention the endless cultural attractions, shopping and dining opportunities. English Bay Beach is the quintessential urban beach with gorgeous sand on one side, and shops and eateries on the other. It’s also considered one of the top spots for swimming, particularly on a warm summer’s day, for those who want to enjoy a refreshingly cool dip. Wreck Beach is a locals’ hotspot, a 4.5-mile clothing-optional stretch of sand that’s popular with nudists, though baring it all isn’t required. You’ll need to take a short hike through the woods, which keeps it hidden from most visitors - just be sure to check out the tide tables first, as a high tide leaves much of the beach underwater. Kitsilano Beach, or Kits Beach as the locals refer to it, offers a wrap-around view of the city, ocean and mountains. It attracts sun-worshippers, joggers, families and people of all types. You can toss a blanket down on the sand and relax, go for a swim in the huge heated outdoor saltwater pool or throw a Frisbee in the grassy area. Spanish Banks tends to be the least crowded, and is popular for long walks as well as skim boarding. Surrey, which is divided into North Surrey and South Surrey, is a Vancouver suburb, the largest in population and area. South Surrey is an affluent area which borders the U.S. and the Pacific Ocean. 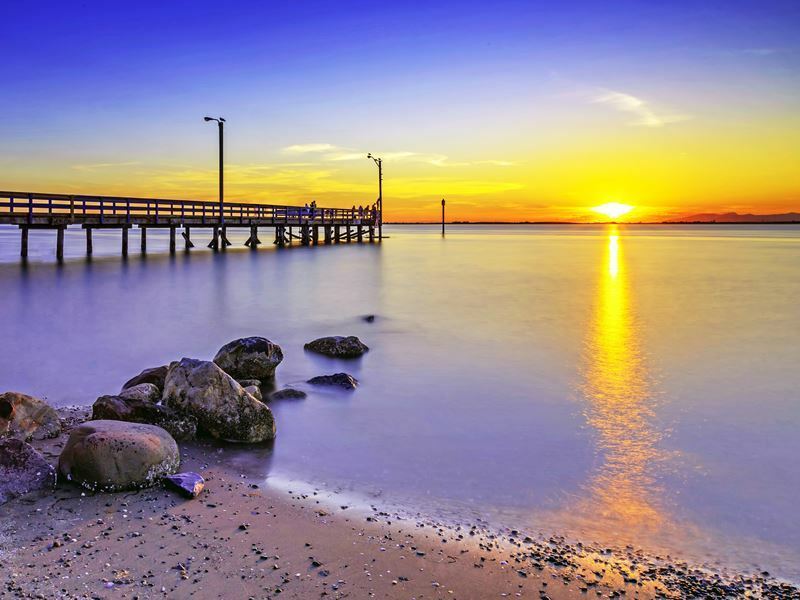 This seaside region is home to a number of beaches, including Crescent Beach, Mud Bay and Whiterock Beach. Crescent Beach, the greater Vancouver area’s sunniest stretch is easily accessible from the city, yet it’s never too crowded. The provincial capital and one of British Columbia’s prettiest cities, Victoria sits at the southern end of Vancouver Island. Filled with attractions, visitors can explore magnificent architecture, fascinating museums and one of the world’s most beautiful gardens, as well as dine at waterfront eateries serving fresh seafood, and hit the beach. This is a city surrounded by the sea, with a lovely harbour as well as a vast network of coves, bays and beaches, many of which provide jaw-dropping views of the Strait of Juan de Fuca and the Olympic Mountains in Washington State, just over the Canadian/American border. One of the best beaches for summer swimming is Willows Beach, which hosts a long sandy stretch and an esplanade that runs right alongside it. It also has a large grass area with trees for shade that’s ideal for picnics. The shallow water warms up to a comfortable temperature on hot days, perfect for wading and splashing around, even for the little ones. Victoria is also a great jumping-off point for whale watching excursions and a host of other tours on the water. 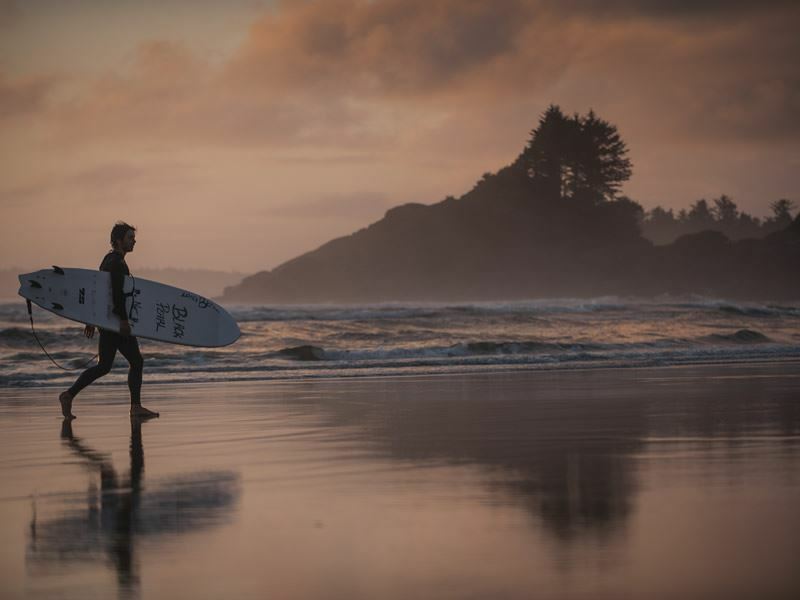 Located in Pacific Rim National Park along the west coast of Vancouver Island, Tofino may be the province’s most stunning coastal town. It’s the village hub for a long series of beaches on the central part of the coast, and the country’s only surfing destination. Wild and remote, this is an ideal spot for enjoying awe-inspiring views of the Pacific, as well as hikes through the dense temperature rainforests, where 800-year-old cedar trees line a wooden boardwalk. 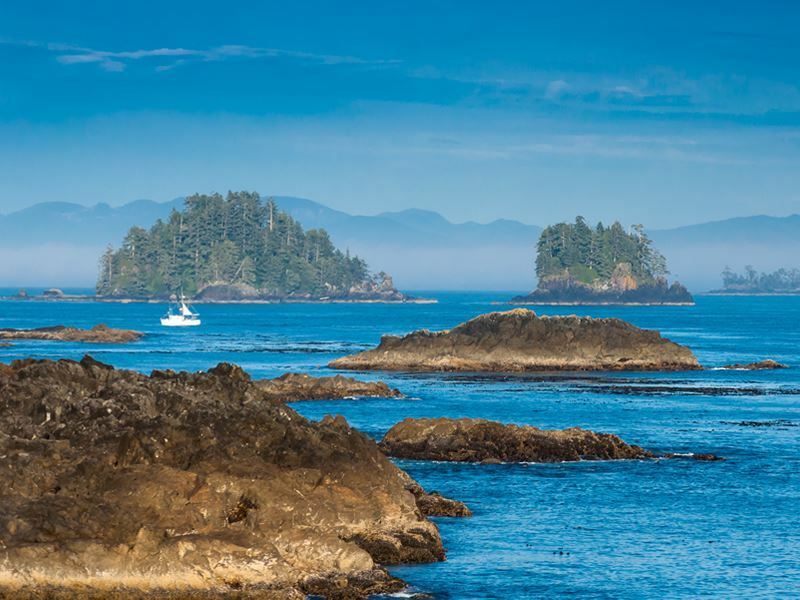 Visitors can take boat excursions into the sheltered bays of Clayoquot Sound, where black bears gather to feed on shellfish and crustaceans along the shore, and enjoy whale watching too. Grey whales are commonly spotted, along with the occasional orca and humpback whales that pass along the coast. Here, the beaches are long, flat and sandy, ideal for walks and beachcombing. This is a beachcomber’s paradise, though it’s also a wonderful place for just relaxing, soaking up the scenery and the laidback atmosphere. In town, you’ll find an endless bounty of fresh seafood, including lots of grilled salmon that can even be paired with a locally-made seaweed beer. 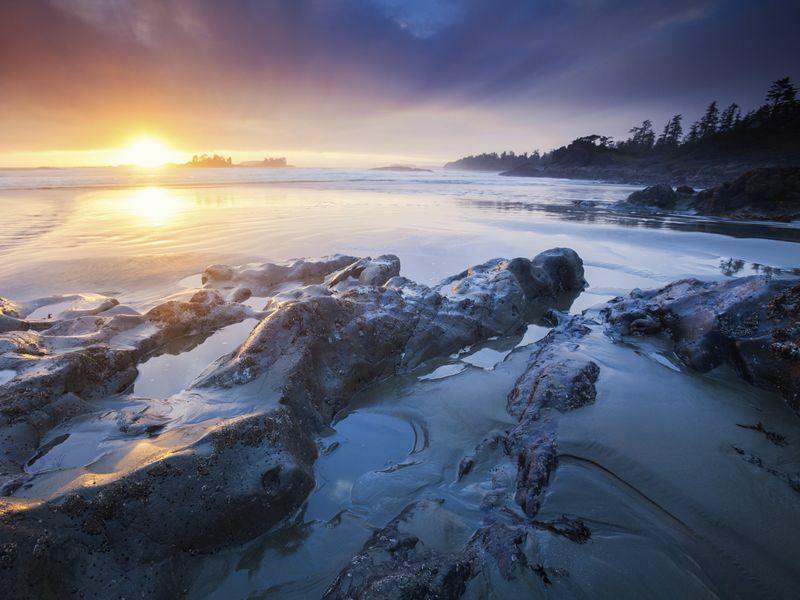 About 40 minutes south along the pristine coastline from Tofino, Ucluelet also enjoys the rugged, wild beauty of the Pacific. Visitors can look forward to ocean kayaking, surfing and hiking. 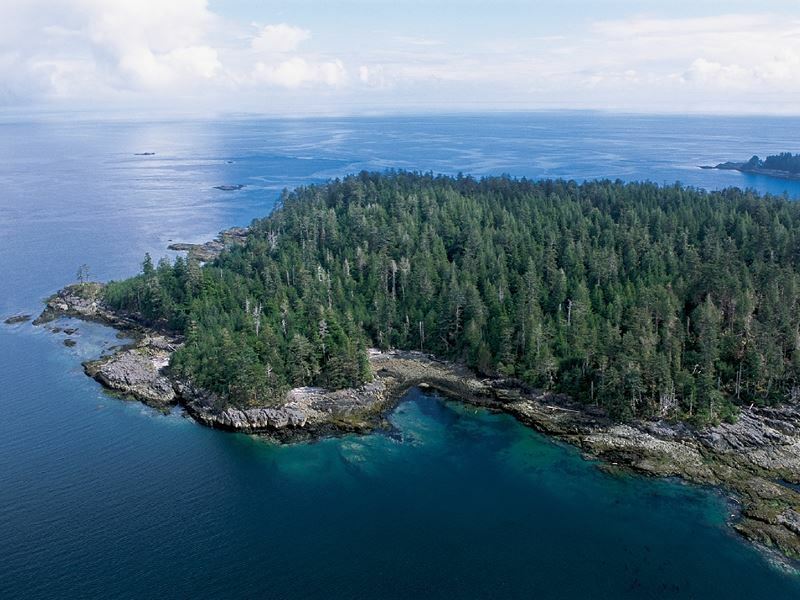 Immediately south of town is the Broken Group Islands, some 100 small islands that provide the ultimate wilderness coastal experience in the calm, sheltered waters for enjoying tours like scenic cruises and wildlife watching for bears, whales, sea lions, sea otters, harbour seals and bald eagles. In the village you’ll find a range of foodie delights, from mouth-watering fish ‘n’ chips to salmon pie. There is an impressive array of shops too, including the chance to shop for Murano glass and unique amber jewellery, as well as First Nations carvings and jewellery. 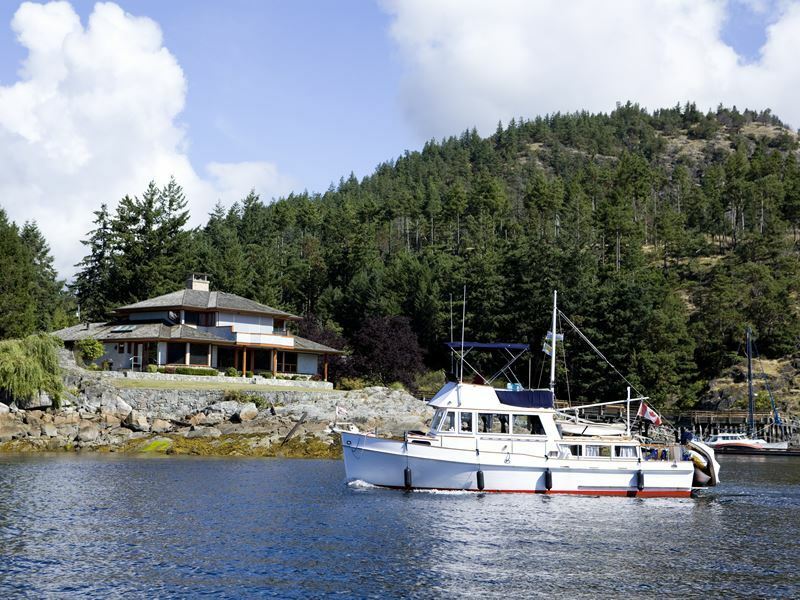 Sechelt is one of the Sunshine Coast communities, surrounded by mountains and hosting over 20 miles of shoreline. It’s a fabulous spot for getting away from it all and enjoying a host of outdoor adventure, including kayaking, diving, hiking, biking and camping. One of the most unforgettable experiences here is paddling out in a kayak to Smuggler’s Cove, renowned for its rugged cliffs and calm, clear waters. Gaze up and you’re likely to see multiple bald eagles hanging out in the trees or soaring above. 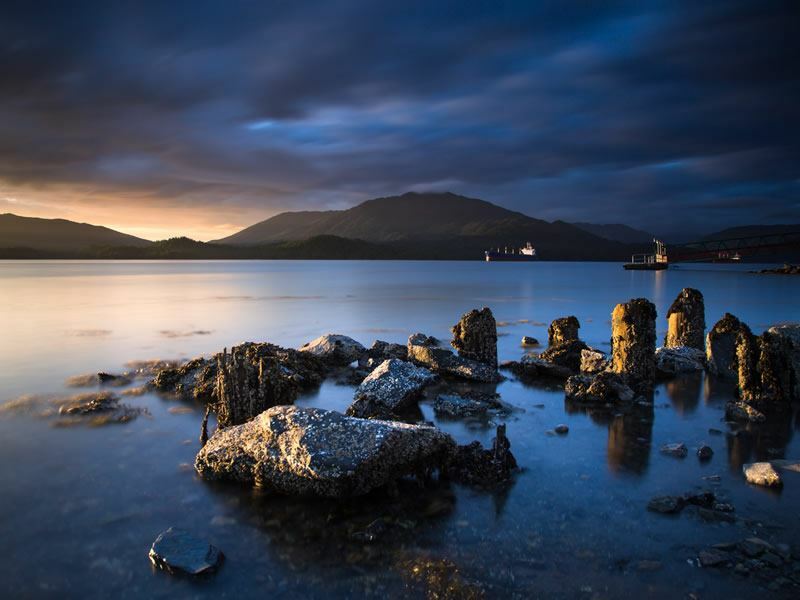 Just before the British Columbia coast turns into the British Alaskan panhandle, situated on Kaeien Island, you’ll find the small town of Prince Rupert. It’s best-known as a popular cruises stop, as most stop here on the way to Alaska, but it offers a number of highlights of its own. It enjoys a charming small town mentality, friendly locals, fantastic sunsets and multiple scenic hiking trails in addition to hosting grizzly bears nearby at Khutzeymateen Sanctuary, one of the best places in the world to view these magnificent creatures in their natural habitat. Join an excursion to explore the protected reserve from the safety of a boat, without disturbing the animals. Afterward, at Cow Bay, a three-block area in town decorated with cows, you can check out local art work and enjoy a good seafood meal. Ganges Village is the main town on Salt Spring Island, one of the Gulf Islands along the west coast, located between the mainland and Vancouver. The most popular of this island group, it boasts scenic beaches, forested trails, and welcoming locals as well as a wide array of dining options. The Saturday Market, open from March through October, features fresh local produce and internationally acclaimed arts and crafts, including fine art and photography, fibre artists, jewellers, potters and much more. There’s also a winery, with tastings offered in the summer that can be paired with delectable local cheeses and desserts. Galiano is one of the less-developed of the Gulf Islands, providing a uniquely tranquil wilderness experience. Here you’ll find both pebble and sandstone beaches, as well as a good variety of award-winning restaurants, many of which feature fresh ingredients from the island’s organic farms. Activities here include everything from whale watching, kayaking, sailing and fishing to golfing and attending art shows. As with most other British Columbia coastal destinations, visitors can enjoy watching for a wide array of animals on land, in the sea and in the sky. The village of Queen Charlotte, located on Graham Island, is most often referred to by residents as simply Charlotte or Queen Charlotte City. This community, set between the sea and the mountains of Haida Gwaii, formerly known as the Queen Charlotte Islands, is very remote and not easy to reach. Still, it’s worth the effort, providing the chance to glimpse a largely undeveloped world, with its rugged coast and totem poles, as the traditional homeland of the Haida Nation. Be sure to stroll the seawalk, where you can take in sweeping vistas of Queen Charlotte Harbour and the Skidegate Inlet. A visit in late summer brings the chance to walk the trails that wind through the alpine meadows, bursting with multiple species of plants that are unique to the islands this time of year.